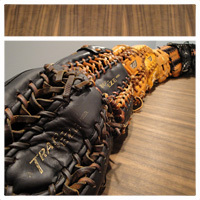 I feel bad for this guy...http://www.ebay.com/itm/VINTAGE-WILSON-A2000-XLC-BASEBALL-GLOVE-MITT-A3000-RHT-JAPAN-RARE-/142149088063? That thing is about as rare as a Honda Accord or Toyota Camry driving down the street! Gently used my a$$! "only signs of use being purely cosmetic"
Goes from Good condition to Fair condition, to......? His gloves so beat up, the web busted and it looks like he tried fixing it with some RUBBER of all things..... jezz..... what'll they try next?!?!? That griffey is $$, but man does it looks great! !